Digi-Schlock: THE PEOPLE UNDER THE STAIRS (Scream Factory Blu-Ray) – Schlockmania! Scream Factory has dipped into the Wes Craven filmography for blu-ray updates before via special editions of Deadly Blessing and Swamp Thing. 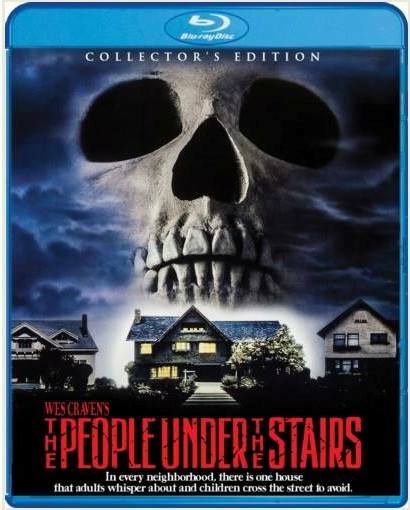 However, they’ve moved into a new echelon of Craven fan-favorite territory with their new blu-ray version of The People Under The Stairs, bringing it into the HD realm and adding an array of new supplements. The transfer used here offers a step up in color though details don’t pop the way HD enthusiasts might want them to. Rumor has it this was an older master so don’t expect the “wow” factor you might get from a new remaster. That said, the quality is pretty solid throughout and is an improvement on old SD versions of the film. Both 5.1 and 2.0 lossless stereo tracks are provided. The 5.1 was used for this review and is fairly subtle in its use of surround but adds some extra oomph to the score and key suspense setpieces. Where this disc offers a dramatic improvement is in the extras department. Things start off with a pair of commentary tracks. The first pairs writer/director Wes Craven with extras producer Michael Felsher. It’s an excellent track that gives Craven the chance to show off his smarts as he reveals the complex web of inspirations behind his storytelling choices, discusses how the politics of the times inspired its themes and even some interesting insight into his troubled childhood. The second track is a cast reunion and that pairs protagonists Brandon Adams and A.J. Langer with cellar dwellers Sean Whalen and Yan Birch. There’s no moderator on this track and that’s unfortunate because the resulting track suffers from gaps of silence and a lack of direction. There are some bright spots – like Whalen telling a funny story about the first time his fraternity brothers saw the film – but the track could have used a guiding hand to bring out more information from this crew. Next up are a quartet of a new featurettes produced by Felsher. The first is a nearly 20-minute chat with Wendy Robie, who discusses her villain role with great fondness and enthusiasm. She reveals how Silence Of The Lambs inspired her approach to her audition, offers her interpretation of her character’s origin and tells a fascinating anecdote about she acted out one of the film’s most brutal scenes with Langer. 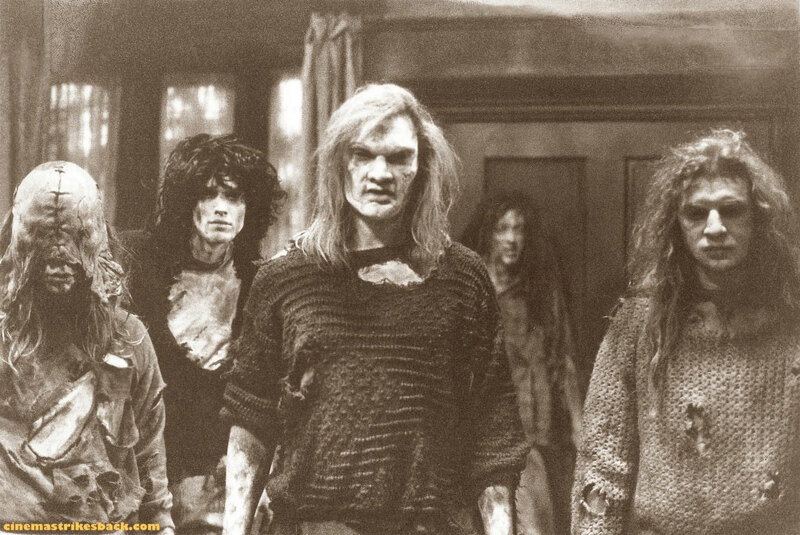 FX men Robert Kurtzman, Greg Nicotero and Howard Berger get a 15-minute segment where they discuss the concepts that guided their makeup design for the film’s cellar people and the challenges of crafting the film’s full-body dummy. Cinematographer Sandi Sissel also gets an interview in which she talks about transitioning from documentary work to shooting a horror film and the techniques and tools she used to get the film’s shadowy look. The final interview is with composer Don Peake. He’s got the most interesting background of any interview subject here, having worked with the Everly Brothers and Phil Spector before getting into soundtrack work. He discusses working with Craven on The Hills Have Eyes and coming in at the eleventh hour to rescore People with a twelve-tone scale approach to electronics. Also provided are just under seven minutes of behind-the-scenes footage from Nicotero’s collection. It focuses on the scene involving the full-body dummy and shows Craven at work directing. The remainder of the extras are devoted to promo materials. A punchy trailer plays up the creepy vibe of the film’s house and a trio of t.v. spots offer fast and flashy variants on material from the theatrical trailer. A vintage making-of EPK highlights several clips and a few Craven soundbites in just under four minutes. An animated set of storyboards explores four sequences, including a robbery scene that was dropped from the film, and a still gallery offers fifty images’ worth of stills, publicity photos and ad art. All in all, this blu-ray is worth the time for devoted Craven fans as the extras really enhance its value. 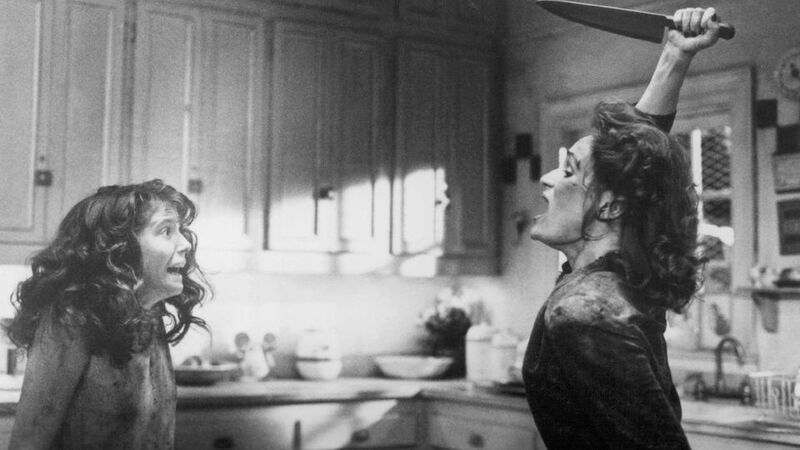 To read Schlockmania’s film review of The People Under The Stairs, click here.